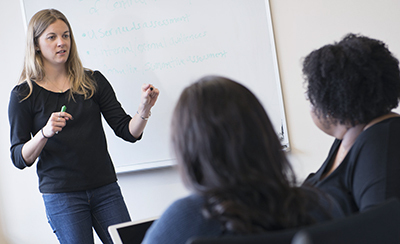 The School of Information Studies (iSchool) will host an on-campus information session for its graduate programs in information management, library and information science, and library and information science-school media specialization on Tuesday, Nov. 15, from 5:30-7 p.m. in the Katzer Room, 347 Hinds Hall. Faculty, staff and current students will be on hand to discuss the program offerings and answer questions about graduate study at the iSchool. Faculty, staff and current students will be on hand to discuss the program offerings and answer questions about graduate study at the iSchool. Refreshments will be provided, and online registration is encouraged. iSchool graduate programs are flexible, and offered in on-campus and online formats that can be completed in full-time or part-time study. For current Syracuse University undergraduates, separate Fast Track information sessions will also be held on Nov. 8 and Dec. 5. These sessions will cover how students can take courses and earn credits toward their information management master’s while completing their undergraduate degree. For more information about iSchool graduate programs, contact Melissa Lopoo, Graduate Recruiting Specialist, at mslopoo@syr.edu, or 315.443.8826.